This English idioms lists includes expressions which have a main word that begins with the letters "X, Y or Z." If you want to learn idioms that start with other letters of the alphabet: click here to go to the main idioms page. An idiom is a group of words whose meaning is different from the individual words if you looked them up separately in the dictionary. 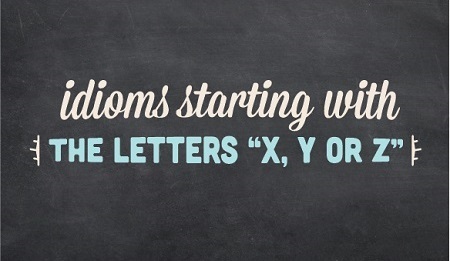 Here are the most common idioms beginning with these letters - and you'll immediately notice that there are very few idioms that have a main word beginning with "X." This is not surprising since there aren't many words that start with the letter "X." It's most important for beginning and intermediate students to focus on understanding, rather than using idioms at the beginning. Idioms are a bit tricky and it's easy to make mistakes. But you'll remember them better if you try to form your own sentences and I'm here to help correct any mistakes. So in the comments section below, please try to use one or two expressions from this English idioms list to create your own sentences.